The Bible says that salvation is by grace through faith alone in Jesus Christ. 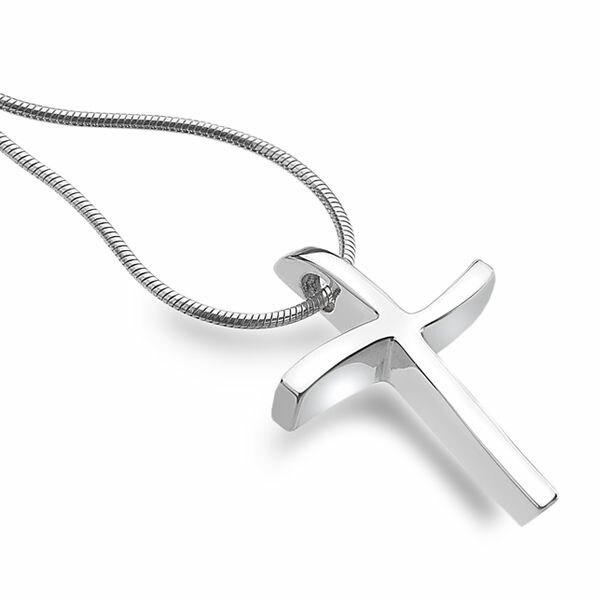 The "Saved by Grace" Cross Necklace for women from Apples of Gold Jewelry is crafted in pure .925 sterling silver and includes an 18" 1mm sterling silver matching chain necklace. The cross pendant has a feminine, wavy-design shape and measures just under 1 3/16" tall x 13/16" wide and has a hidden bale at the top, where the chain slides through (please note: picture is zoomed in for close-up. Chain is fine and feminine but sturdy enough to comfortably hold the chain). The quintessential Bible verse for salvation by grace through faith alone is Ephesians 2:8-9, which says: "For by grace are ye saved through faith; and that not of yourselves: it is the gift of God: Not of works, lest any man should boast." The Bible is clear that salvation cannot be worked for, it can only be atoned for. If salvation is the "gift of God", it is free. All you have to do is believe that Jesus Christ is God and that He died on the cross for your sins, was buried, and rose again on the third day! We guarantee our Saved By Grace Cross Necklace for Women in Sterling Silver to be high quality, authentic jewelry, as described above.